Tensions have risen dramatically in the Korean Peninsula after North Korea tested an intercontinental ballistic missile last month. Since the 1960s, North Korea has been trying to develop nuclear capabilities, much to the dismay of South Korea, a close ally of the United States. 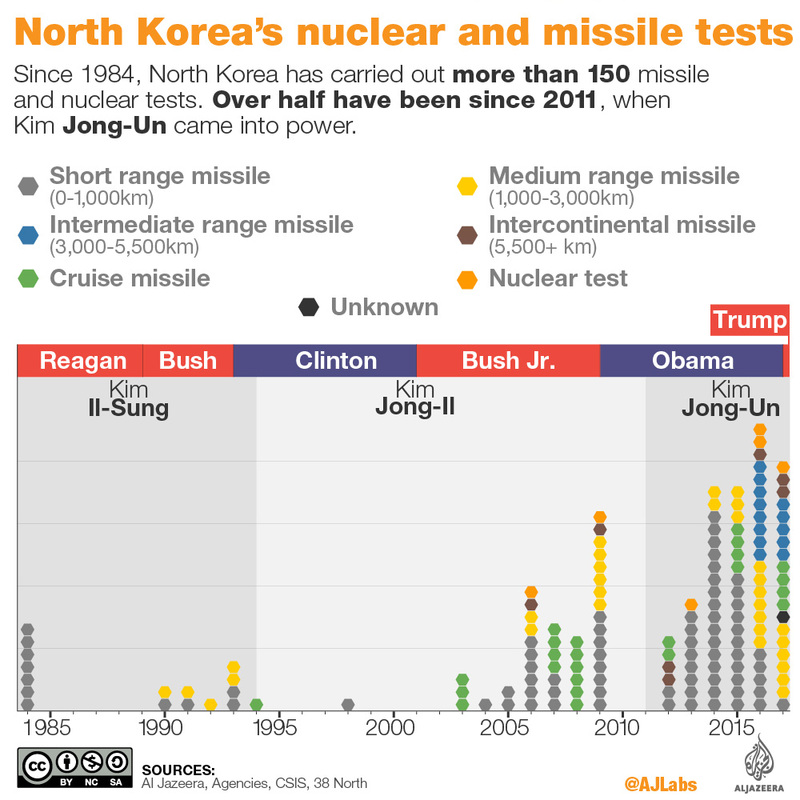 North Korea's leader Kim Jong-Un has steadily increased the number of ballistic missile tests since he came to power after his father Kim Jong-Il passed away in 2011. The country's nuclear programme was launched in the Soviet era with the construction of its first nuclear reactor in Yongbyon in 1965, but it carried out its first successful nuclear test in 2006. 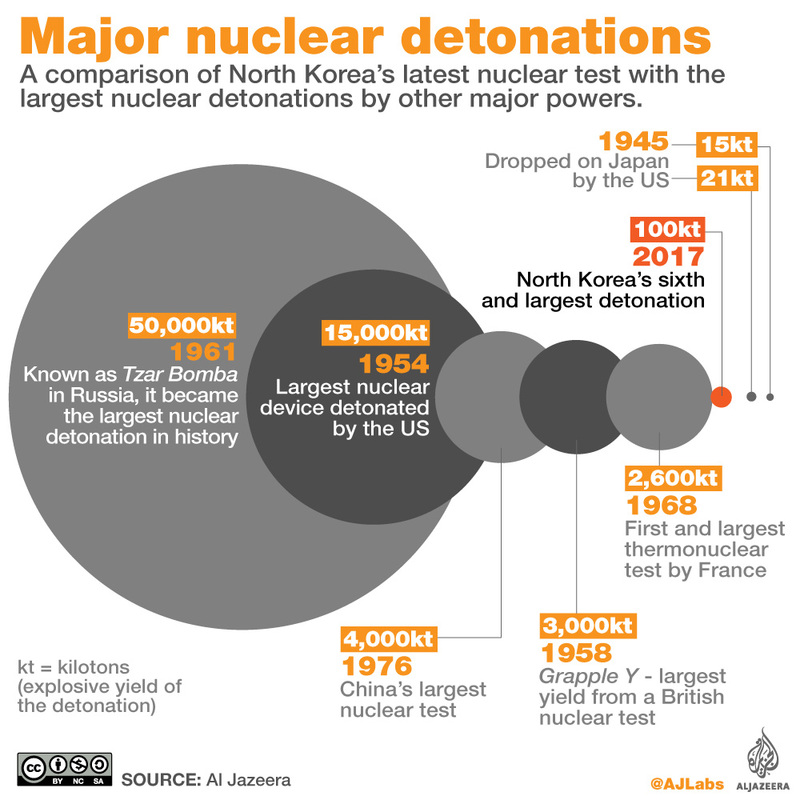 After withdrawing from the Nuclear Proliferation Treaty in 2003, North Korea has gone on to conduct several nuclear tests, most recently in September 2016. Pyongyang has also ground-tested a new rocket engine and test-launched ballistic missiles. The reclusive state's nuclear and ballistic programmes have invited more than one round of sanctions, the latest by the United Nations Security Council that will ban exports worth $1 billion. In 1950, North Korea invaded South Korea, starting the three-year Korean War. 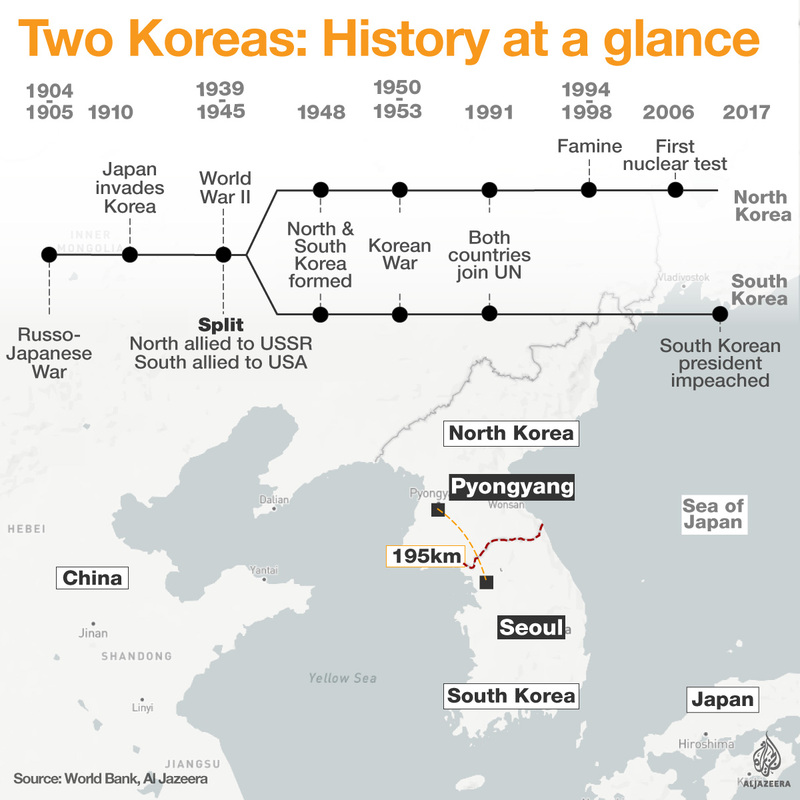 Since the signing of the armistice agreement in 1953, North and South Korea have been divided by a 4km wide demilitarised zone stretching 250km. Seoul, South Korea's capital and largest city, is within close range of this demilitarised zone and could be hit by North Korean artillery in case of hostilities. Both Koreas have steadily increased their military spending over the decades. The US has thousands of its troops stationed in the region, making the Korean Peninsula, located between the Sea of Japan and the Yellow Sea, one of the most militarised zones of the world. Today, North Korea spends more than any other country on military spending as a percentage of gross domestic product (GDP). Nearly a quarter of its GDP goes towards the military. With almost 1.2 million people currently serving in the military, North Korea also has the world's fourth largest army. 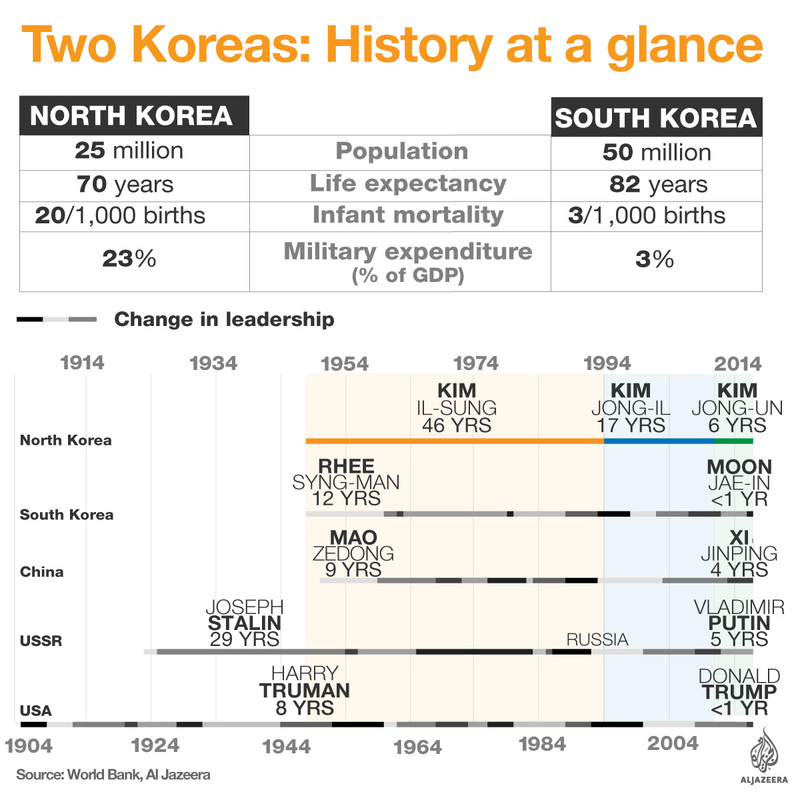 As world leaders have come and gone, North Korea's Kim dynasty has remained in power. 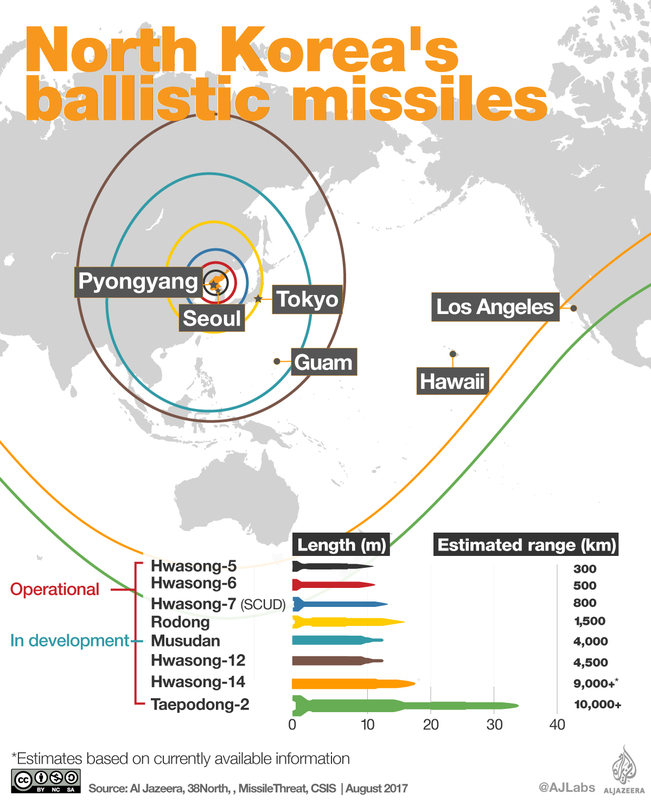 What is the reach of North Korea's ballistic missiles? Over the last few years, North Korea has tested several ballistic missiles with varying degrees of success. The leader of the country, Kim Jong-un, has promised to continue the tests, drawing condemnation from the US and its regional allies, South Korea and Japan. North Korea is barred under UN resolutions from any use of ballistic missile technology, but six sets of UN sanctions since Pyongyang's first nuclear test in 2006 have failed to halt its drive for what it insists are defensive weapons. The United States fears North Korea may one day use its missiles to deliver a nuclear payload to its west coast. This fear has increased after Pyongyang's ballistic tests in July. It is unclear yet if the country is capable of putting nuclear bombs on these newest missiles, but the increasing technological capabilities prompted US President Donald Trump to say that any threat to the US would be met with "fire and fury". What are North Korea's nuclear capabilities? However, since 1984 the isolated North Asian nation has significantly upped its activities towards this goal. Under the then leadership of Kim Il-sung - the first leader of the communist country - North Korea launched its first missile tests of significance. After Kim's death in 1994, his son Kim Jong-il became supreme leader of North Korea. He carried on his father's legacy and ramped up the scale of both its nuclear and ballistic missile programmes. This led to the first nuclear test and first launch of an intercontinental ballistic missile (ICBM) in 2006. Although the ICBM test failed, it was clear to the world that North Korea's military capabilities were increasingly rapidly. In 2011, Kim Jong-il died and his son Kim Jong-un came to power. Since then he has pushed the nuclear programme to new heights with more tests and improved capabilities. Over the last few years, North Korea's nuclear capabilities have improved significantly. The country's most recent nuclear test had a yield of about 100 kiloton, about five to six times more powerful than the nuclear bombs that were dropped by the United States on Hiroshima and Nagasaki in 1945. The United States, North Korea's main enemy, is fearful a nuclear-armed ICBM could be used to target American cities. 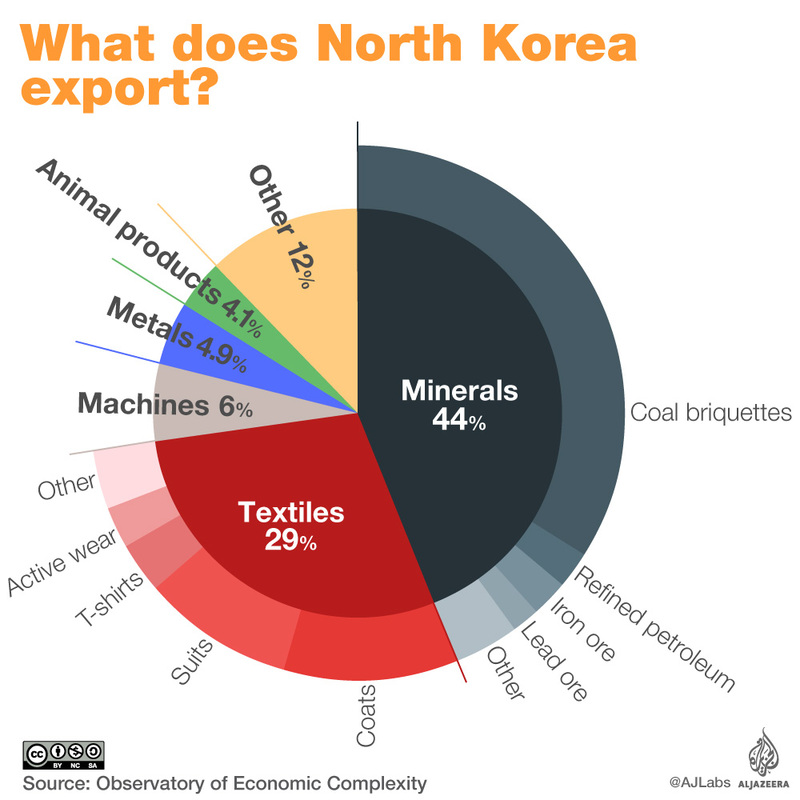 Sanctions imposed by the UN have made it hard for North Korea to trade with other countries. Its main trade partner is its neighbouring country China. Over 80 percent of North Korean import and export trade is done with China. The latest sanctions focus mainly on North Korean exports, prohibiting the country from trading coal, its main source of income. 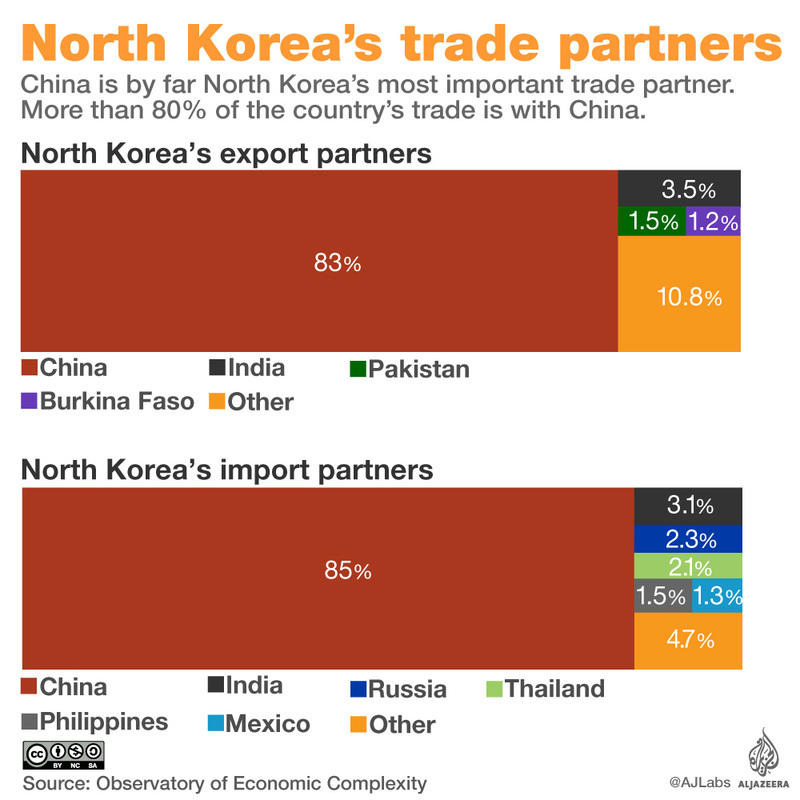 China, one of few countries friendly to North Korea, voted in favour of the new trade restrictions.